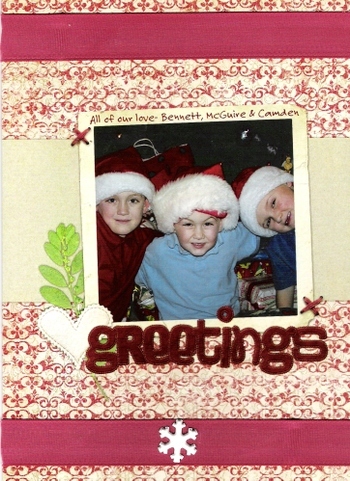 Hybrid Holiday Inspiration: Alicia shares a card! Card making during the holiday season can be overwhelming if you are trying to scrap each card by hand. I have found that a hybrid approach for creating my cards to be just as satisfying. It is easy, fun, and creative. I like to keep it simple so all I did for my cards this year was have the cards printed for me from Shutterfly, then add my own personal touch with some ribbon and a brad. 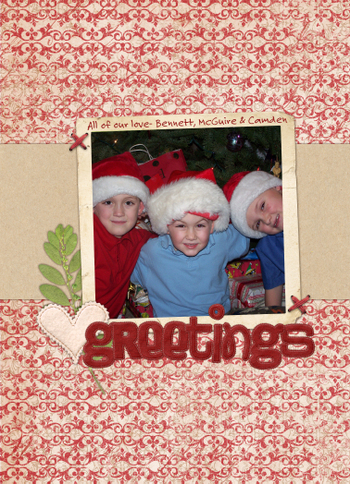 The samples below are created using a holiday card template from Katie Pertiet, owner of designerdigitals. To create a card using a template, you simply insert a family photo into the card using a photo editing software like Adobe, uploaded the image to Shutterfly, then have Shutterfly print it. It is easy and looks great. Don't stop there, check out the second sample below. I added a strip of red ribbon onto the top and bottom of the card and attached a snowflake brad. It added just a bit of dimension to my card and looks like I spent hours hand creating each one. It literally took minutes. I encourage everyone to try to add a personal touch to each of their digital cards this holiday season!